Is your baby hungry or tired? Does she have a tummy ache or does he just need a diaper change? 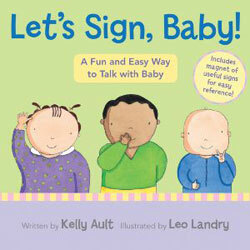 It’s easy to know when you and your baby learn to sign together. 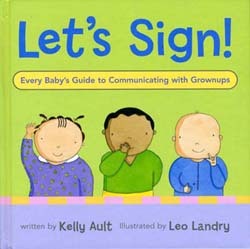 Studies show that babies who sign develop increased vocabularies, experience less frustration, and begin to speak earlier. These short stories, playful pictures, and clear instructions are practical for parents and fun for older siblings. Let’s Sign! is designed to help you more fully enjoy mealtime, playtime, bedtime, and other daily activities with the baby in your life. Eat Your Peas, Ivy Louise! 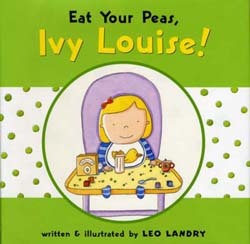 Ivy Louise’s parents encourage her to eat, unaware that the tiny green peas are performing a circus on her tray. Babies everywhere–playing, eating, singing, dancing, counting, and sleeping! Delicate watercolors catalog babies in a variety of sweet and shy poses.